Our Industrial Linear Motion System has long been a star performer as a standalone product and many customers appreciate the advantages the Robotunits Linear Motion System brings. Where the Robotunits Industrial Linear Motion Systems stand out from all other offerings on the market is the easy integration into existing assemblies. This will save the user an excodinarry amount of time in design and assembly and of course will boil down to outstanding cost savings overall. 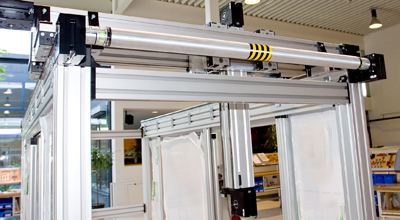 Robotunits Industrial Linear Motion Systems come as a standard based on our 50 x 100 or 100 x 100mm Aluminium Extrusion. They can also be build with other extrusions from our system 50 ranges like the 100 x 200 mm extrusion for example. The hardened guiderails are inserted into our standard aluminium extrusions and they align themselves to one datum edge to assure the highest accuracy. The sliding plate is also a standard extrusion from the Robotunits range of Aluminium Extrusions, measuring 200mm x 25mm. They are also comprising the standard Robotunits T-Slots making it easy to add standard components even to the sliding part of the Industrial Linear Motion System. Bearings and rollers are all designed to withstand high loads. Standard units are rated at 3000 Newtons of payload in radial as well as axial direction. Higher loads are possible with special designs. The guide rollers are also mounted on adjustable eccentric bolts making it very easy to adjust the play or accuracy of the unit. The system is driven via a steel reinforced T8 timingbelt. This makes high acceleration and deceleration possible. 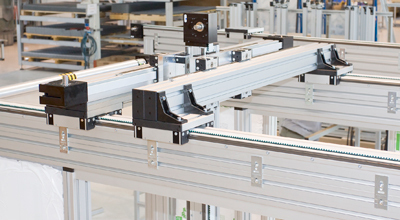 Because all industrial linear motion systems are designed based on our standard aluminium extrusion system they fit perfectly into the Robotunits Modular Automation System. The below picture is a perfect example of this. 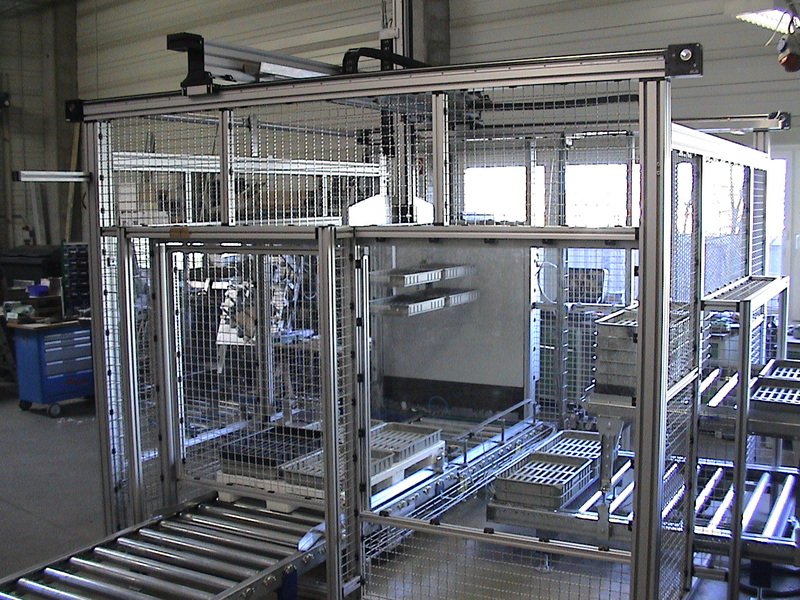 A customer needed to build an enclosed X-Y-Z Gantry System over a roller conveyor. 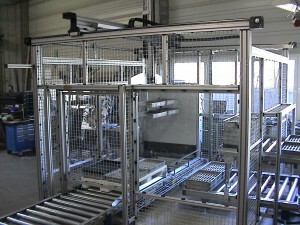 As you can see the complete solution was built with the Robotunits Modular Automation System. This has reduced the design, build and assembly times to a bare minimum. The customer had this solution up and running in a very short amount of time, saving him thousands of dollars compared to a traditionally build system. If you do have a project where a industrial linear motion system is needed or indeed a complete X-Y-Z Gantry System then please call us on 03 9334 5182. We are eager to help you design a solution that will not only save you time and money but will also look great once installed. Proven Concept: Linear Motion Systems from Robotunits! High Quality, easy configuration, quick & seamless integration. Designed around the Robotunits extrusion and fastening technology, this flexible linear motion system offers you an unmatched combination of versatility, stability and efficiency. This customer application required a robust pick & place positioning system to lift, turn and relocate gear covers onto a Robotunits conveyor to transport the parts to the following station. The entire X-Y-Z system could be designed and built with standard components which reduced lead time and added to the bottom line of the project.